I did my first market (the Fremont Market in Seattle which is every Sunday) ever on Sunday! Since I mostly wholesale these days, it was nice to get out and talk to a bunch of people in person. I have missed that now that I no longer work in a yarn store. 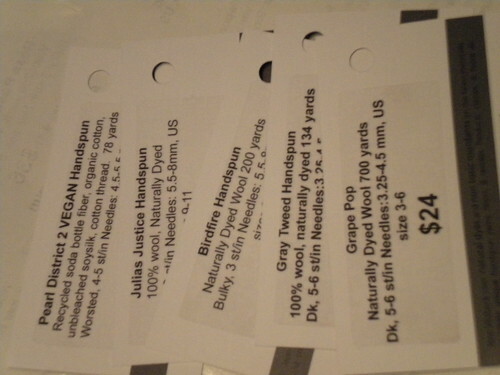 I changed over all my tags so they could have prices on them more legibly. My handwriting usually doesn't leave much space for pricing on the back otherwise! I went through and relabeled *everything* in inventory. Everything. Total pain, but worth it I think. The market went pretty well, despite the threat of rain. It was windy and cold, but I still made a profit. The only downside? My tent took FOUR people to set up. Part of that was the wind, part never doing it before, (BIG) part I can't lift much weight, and part my tent is all pipe pieces, not an "EZ up" style one. If I do more shows or markets I will need to get an easier to put up tent, since physically there is no way even with a friend I can easily put this tent I have up. I was super glad a friend came with me- besides the fact that I am super shy, having someone to help load and unload stuff was a huge help. I am still pretty- ok, very- sore from the market though. There was a ton of interest in my classes, and little kids LOVED my booth. I brought my spinning wheel, so all the kids wanted to figure out how it worked. As expected, the rocket hat and cloche hat patterns were popular, and people were very interested in my yarns that had plastic soda bottle fiber in them*. I got these last Sunday. 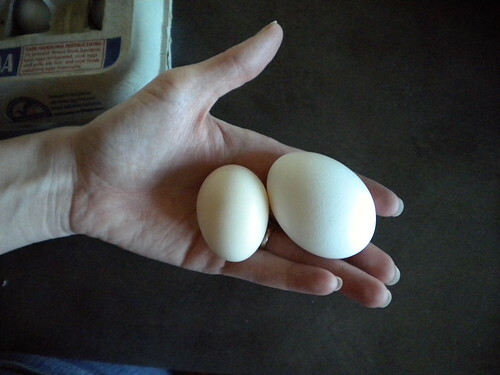 The large egg is a normal sized one, but a farmer brough tiny eggs to the market. I had planned to blow the yolks out and dye them for Easter, but ended up using them for popovers instead. They had really big yolks for their size! *Which is awesome, since I just found a local source!